Maids of Honour Row is ‘an excellent, entirely uniform, terrace’ of four three story houses each five windows wide with a parapet hiding the roof. They have distinctive pink “rubbed” brick dressings to the windows, set off by white-painted sash windows, keystones and cornices. The Row was built on the site of Henry VII’s Palace at Richmond, just beside the entrance gate. The maids received a stipend of £200 per year in addition to their board and lodgings in these houses. The rate books of 1780 and 1790 show that No 1 was occupied by Dr John Worgan (1724-90), organist of Vauxhall Gardens and of several London churches. 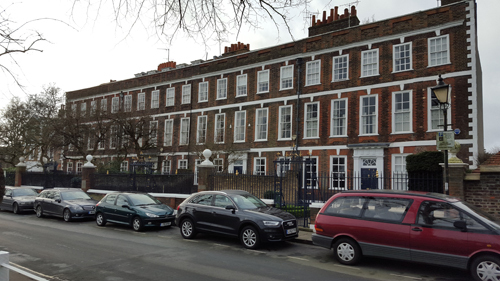 Colonel Joseph Burton was a sub-tenant of that house in 1831, when his son Richard Burton, the explorer, attended Dr Delafosse’s school on Richmond Green. 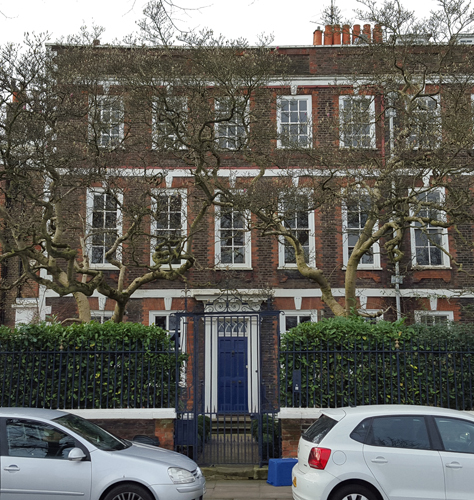 In Charles Dickens‘ Great Expectations Estella came to London to be introduced to aristocratic society by a Mrs Brandley who lived here. No 1 was one of my first projects. I was asked to provide advice on the use of paint and colour for the interior. Recently I had the pleasure of being asked to help a subsequent owner with paint colours in this house. Although I had only a dim memory of the main rooms it was wonderful to see the house again. 1 Sally Jeffery. The Building of Maids of Honour Row, Richmond. The Georgian Group Journal Vol.XV111 2010. 65-76. 2 I am grateful to Hilary Barnfather for pointing out Sally Jeffery’s article to me. I googled the address and up came the house my Swiss grandmother worked at in the early 1900s! Dr. John Worgan was my g-g-g-g-g-grandfather, pretty cool that I can see where he lived over 200 years ago! Thanks for posting the picture and the history associated with the house. Kerry I am delighted that you were able to make the connection. Thanks. Maids of Honour Row was built as a spec and was occupied by 1719 (not 1724) and not built for the Maids of Honour altho the Crown did rent 2 of them for a short time. The builder was Thomas Honour! Many thanks for your information. Corrections made.